Hello guys! I'm back again with one more post in the series Monsoon Digest. Sadly, since the torrential and continuous rains back on 17th and 18th of this month and our esteemed Meteorological Department proudly announcing the onset of monsoons in all parts of the country, the rains have taken a step back. Most of us, here in Delhi, haven't experienced any rains since then. However for a day or two, the weather has taken a quite turn, but, it's still exorbitantly hot and clubbed with excessive humidity ~90%RH (Relative Humidity), the summers have become excessively unbearable, and we are praying for the rains. This year's monsoon has unfortunately took a very unpleasant turn as a lot of tourists and Hindu and Sikh pilgrims who've been to the parts of Uttarakhand for pilgrimage to sites like Badrinath, Kedarnath, Shri Hemkund Sahib, and others who have been to the hill stations in the adjoining regions, have been either killed, or are missing or are stranded in deplorable conditions away from any help, food or medical assistance. More than this, the weather conditions have worsened with heavy rains and cloud bursts resulting in more loss of life and property, and have very badly hit the search and rescue operations. The whole area is mountainous and has dense forests. Most of the roads built here are carved out of the mountains and due to heavy rainfall and floods, landslides and mudslides have caused damage to most of these roads, further hampering the search and rescue operations, and supply of essential articles like food, medical supplies, clothes, etc, and this is the reason, most of these operations are being carried over the air with the NDRF, the ITBP and Indian Army and Air Forces and officials of other departments including the Police Forces, working continuously over many days to search and rescue people. As of now, the official government estimates state that about 822 people (estimates are as of 25 June, 2013) are feared dead. The numbers of those affected by this flood are more than a lakh (100,000). The unofficial estimates, however, states that the numbers of those died in the floods may be anywhere between 5,000-10,000, as a number of bodies of those dead have been buried deep beneath the stuff (sand, soil, tree trunks, boulders, remains of houses, cars and buses, and whatever came in the route of the water), and equally a large number of bodies have been washed away and carried over with the water, hundreds of kilometers down the river's flow streams. This is sheer fury of the Nature. We must atleast learn now from our past mistakes. Help has been rushed to those who have been affected, or are still suffering. You too can help them out with whatever you wish to. The people need food, bottles of water, medical equipments and medicines, clothes, blankets, and whatever, you think anyone caught up in such a disaster would need. Moreover, you can make donations (in cash) to the PRIME MINISTER'S NATIONAL RELIEF FUND by visiting the website https://pmnrf.gov.in. I'm dedicating this post to the victims of this flood, those who have lost their near and dear ones, those who have lost life and property, and those who are still suffering due to some or the other reason, and also, to the brave hearts of the NDFR, ITBP, Indian Army and Indian Air Force, and officials of other departments including the Police Forces, who have been working continuously to help out the stranded people. 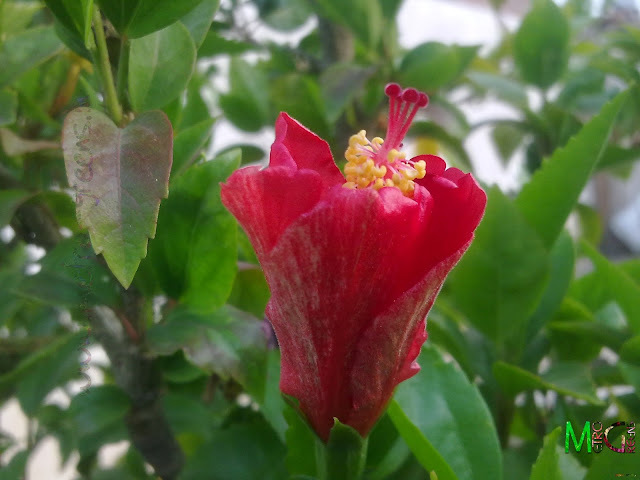 This hibiscus bloom captured today (26-06-2013) in my rooftop garden is dedicated to the victims of Uttarakhand Floods, and the people who have helped and are helping these victims. The following are the helpline numbers for information on the flood situation. My thoughts are with those who have been affected by the terrible weather conditions. Such a tragedy on such a large scale. its the retaliation of Mother Nature.. Urbanization and Industrialization ..and above all Selfish intentions of Human Race...everything is provoking nature to behave as ferocious as possible !! Commoners are first to suffer ! !